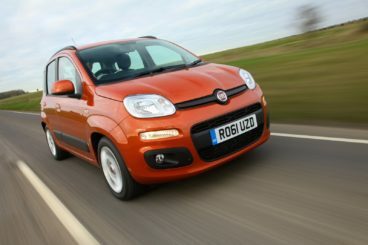 The new Fiat Panda Diesel Hatchback is spacious, affordable and lots of fun in the towns and cities. Think of it like a less retro and more practical version of the Fiat 500 and you’re on the right track. And while it’s less retro and more sensibly styled, it can still boast a welcoming, funky interior. OSV takes a closer look at what it’s all about with our 2018 Fiat Panda Diesel Hatchback review. The Panda’s natural habitat is the towns and cities, where its light steering proves super useful. A City button lightens up the steering even more when you want to park up in a tricky spot, and it will prove handy on many occasions – indeed, there’ll be times when it proves itself to be a total lifesaver! Soft suspension is also the order of the day, and the car is able to deal with lumps and bumps pretty well. It can even smooth out rougher surfaces, something which its predecessor wasn’t able to do. The car also offers fantastic visibility and a high driving position, and this further contributes to its adeptness in the city. Out on the open road, there are no concerns with the Panda’s handling. However, its engines aren’t really up to the task and they lack refinement. Out on the motorway, the Panda will struggle too. That said, the diesel engines are more up to the task than the petrols if you’ll be spending a lot of your time on the motorway. There’s just the one diesel on offer, and you can only get it if you opt for either the Panda Cross or Panda 4×4 model. It’s a MultiJet 1.3-litre unit that develops 94bhp and has a 0-62 time of around 11.5 seconds. It’s got a decent amount of torque and pulling power (more than the petrols), but it boasts a poorer rev range. As a result, it’s useful for overtaking but will make a fair amount of noise when you first start it up. In the towns and cities, though, it’s ultimately not as engaging as the petrols. This is a small car but, thanks to its pretty big windows and tall roof, it actually doesn’t feel cramped inside. 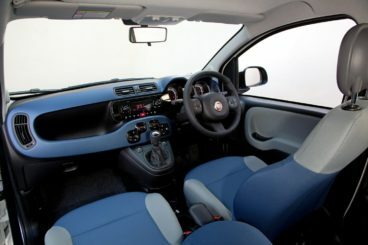 It’s nicely designed too, with the Panda getting a design theme that Fiat likes to call a squircle – a sort-of round-edged square that you’ll find on various dials, buttons and the dashboard itself. There’s nothing wrong with the way the cabin is designed, but some buyers will take issue with some of the cheaper plastics on display. It isn’t even that they look cheap and tacky – the biggest worry is that they won’t last too long. Comfort-wise, it’s a shame that the seats are a bit firm, while the steering wheel can’t adjust up and down. Is the Fiat Panda Diesel Hatchback practical? For a car with such compact dimensions, it really impresses us on this front. It’s roomier than many of its peers, something that’s largely down to it being so tall. It’s ideal for four people who want to get out and about. Even on longer trips, four adults should be comfortable enough. Headroom is excellent, and the only people we can see having any problems are really long-legged adults. Storage space is fantastic, with Fiat claiming there are as many as 14 compartments scattered about the place. The boot, meanwhile, measures 225-litres and can be increased to 260-litres if you slide the rear seats forward. You can fold the rear seats too, but a split-folding rear seat will set you back an extra £60. If you want the diesel engine, you’ll need to overlook the entry-level Pop trim, which is only available with the 1.2-litre petrol engine. It’s sparsely equipped in general and gets a CD player, a few airbags, power steering – but not much else. Optional extras include electrically adjustable door mirrors, air conditioning and roof rails. The Easy model gets air conditioning, roof rails and central locking as standard, while the Lounge model gets 15” alloys, fog lights, heated door mirrors and body-coloured door handles. Both these trims can be specified with a Climate Pack that gets you heated mirrors, a heated windscreen and climate control. In terms of how safe the car is, the Panda scored 4/5 when it was crash tested by Euro NCAP. Allegedly, the reason it didn’t land all five stars was that electronic stability control isn’t standard in Europe – although it is here in Britain. Other than that, a city-car braking system, rear parking sensors and hill-hold are all optional. Prices for the new car start out from £9,405 and rise to £12,995. In terms of its running costs, the 1.3-litre MultiJet diesel engine is only available with the Cross and Panda 4×4 models, but if you can afford the initial outlay it’s one heck of a frugal engine. It returns as much as 72.4mpg on a good day and emits just 104g/km of CO2. Should you desire one of the petrols, the 1.2-litre unit can return 55.4mpg at best, while the 0.9-litre TwinAir engine is good for around 66.9mpg. It also emits less than 100g/km of CO2. Prices start out from under £10,000, which is a steal. It’s a fun-loving city car that’s got bags of personality. It’s not jaw-dropping, but the cute and compact Panda looks better than ever. You can only get the 1.3-litre MultiJet diesel if you opt for either the Cross or Panda 4×4 model. The old adage is true that you get what you pay for. Let’s see how the car fares against its rivals in the comparison section of our 2018 Fiat Panda Diesel Hatchback review. The new SEAT Mii might be small but it’s roomy, great fun to drive and doesn’t cost that much to buy. On the road, the Mii has a max power output of just 74bhp, but don’t let that worry you – in the towns and cities, you’ll find that’s all the lively performance you need. And thanks to a bit of handling dexterity, a lightweight and fine steering, it’s also good fun to drive. It can cover long distances better than the Panda, and indeed better than most of its rivals in this sector, with cruise control coming as an option on the SE model and upwards. There aren’t many engines to choose from; in fact, there is just one. It’s a 1.0-litre petrol unit that’s offered with two different power outputs. The smaller of the two develops just 59bhp, while the bigger one develops 74bhp. The latter is only available with the FR-Line model, which means that if your budget is small you’d have to settle for the 59bhp engine. However, there’s not much difference between the two, particularly when it comes to day-to-day driving. The FR-Line model corners better but it’s not as comfortable and it’s slightly quicker. Running costs? SEAT dumped the EcoMotive version of their engine, and that’s a shame as it was capable of returning as much as 69mpg. Both current variants of the 1.0-litre engine return around 64.2mpg at best, which is decent – but way off what some rivals are able to return. Inside, there’s a lot to like about the Mii. It benefits from robust dashboard plastics that look as though they’d be able to cope with whatever family life on the road throws at them, and we love how simple and well laid-out things are. There are one or two issues; for example, the petrol engine can get a bit loud at times, while rivals are able to offer more overall cabin quality. Is the SEAT Mii practical? It might be small but it’s packaged well. 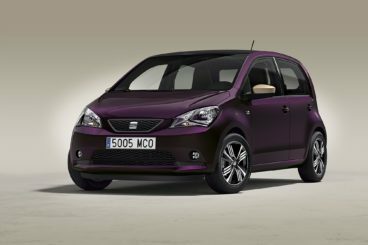 A clever design means it’s a very roomy city car, with a five-door option making it super easy to access the rear seats. The doors open wide, too. Four adults can sit in comfort in the back on longer trips, although legroom might be a bit of an issue for taller adults. Storage space is fine, while the boot measures a respectable 251-litres. Fold the rear seats and it can extend to as much as 959-litres. Like the Fiat and the SEAT, the Renault Twingo might be small but it’s spacious and great to look at. On the road, the Twingo is at its best when it’s in the towns and cities. However, it isn’t as much fun to drive as the Panda or most of its rivals. This is a surprise when you take into account its light weight and rear-wheel drive layout. Alas, those two factors end up counting against it and it doesn’t handle as sharply as you’d hope. In terms of its engines, a 1.0-litre 69bhp petrol unit sits at the bottom of the range. It has a 0-62 time of 14.5 seconds and is probably the one we’d overlook. Next up is a 0.9-litre turbocharged petrol that develops 89bhp, and which has a 0-62 time of 10.8 seconds. That’s more like it. If you want as much pace and power as possible, the range-topping GT model is powered by 109bhp variant of the 0.9-litre petrol engine. It has a 0-62 time of 9.6 seconds and can keep going until 113mph. Running costs? There’s no diesel in the range, but the fact that the petrols are small means that costs are relatively decent. The 1.0-litre engine benefits from stop-start if you opt for the entry-level model and can return as much as 67.3mpg on a good day while emitting less than 100g/km of CO2. Move up the range, though, and costs go up sharply. The same engine powering the higher spec models doesn’t come with stop-start, and as a consequence returns 56.5mpg at best. Inside, the Twingo boasts a modern cabin that’s great to look at and pleasant to sit inside. It looks solidly built, even if some of the plastics don’t seem quite as solid as some rivals. The petrols are a bit on the loud side but the seats are comfortable and there’s plenty of scope for customisation so that you can get the look you want. 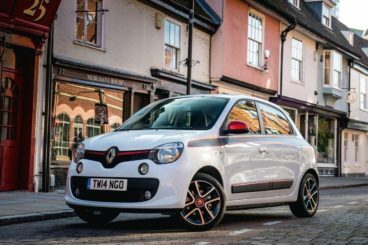 Is the Renault Twingo practical? Visibility is good, interior space is good, and there’s room for four adults to remain fairly comfortable. That said, life isn’t super easy for anyone sitting in the rear. The pop-out rear windows will be a harsh reality on baking hot days, for example. The boot, meanwhile, measures 188-litres, which makes it the smallest in this review. Lock the sits into an upright position and you can extend it to 219-litres – but your passengers will hardly be happy about that! The Panda is one of those that does some things well and other things not so well. If your main priority is a city car that’s stylish and full of character, it’s a good shout. On the other hand, if you want a bit more space and a more modern, upmarket interior you might want to look elsewhere. The Fiat Panda Diesel Hatchback is a good but flawed car.